In my last post, I talked about some criteria for choosing between all-in-one or best-in-breed tools. Now, I’ll apply those criteria to our product space, and try to show why a unified team collaboration tool makes more sense than what you might be living with now. So, let’s imagine that you’re looking to solve the following problem: How can we get everyone rowing in the same direction? By “everyone,” we mean executives, product owner(s), designers, development staff, customer service, maybe even customers themselves. And by “rowing,” we’re talking about all of the things it takes to get your product to the customer — things like planning, design, coding, marketing, testing and support. The worst-case scenario is also the most common — each discipline area adopts whatever tools appeal to them. NB: This is a simplified version of actual events from a previous job. The details have not been exaggerated, and the people involved were otherwise very capable, smart, and successful. The Product Owners all decide to use Trello, and thus force it on the development staff. The designers prefer Basecamp, where they can organize screenshots for the various user stories they’re working on. This means that the Product Owner has to look there as well, and so do the developers, and possibly also the customers. The developers decide on Github, since it’s easy to start and Git is pretty awesome. Customer Support starts a wiki, so they can get all of their procedures and help scripts in one place. They already use FogBugz for tracking customer issues, and neither Trello nor Github has the features they need. This means that the Product Owner and developers have to look in FogBugz almost every day, as they respond to problems reported by customers. The executive staff needs all of the above to keep a handle on what’s happening where. They also create and manage a couple of spreadsheets in Google Drive, to keep summary data for the various projects that are in process, and to prioritize upcoming work. Now with 20% more arrows! Regardless of how good those integrations are, everyone still has to search across two or three or more tools to find what they’re looking for. Each tool you add is another silo of data and process, and more friction in the overall workflow. 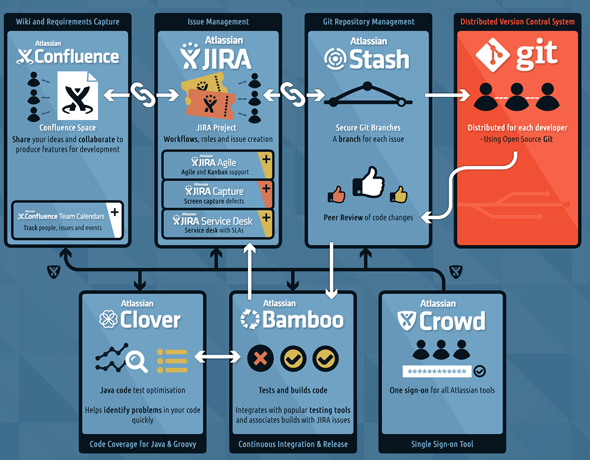 Many teams opt for the Atlassian/Microsoft/IBM approach — buying a set of tools from the same company, with the promise of tighter integration. It’s sold as an all-in-one solution, in as much as you’re buying from one vendor. And for the most part, that’s true — until it’s not. Tool suites like these do a much better job at tying related data together — build status can show up in the related tasks, support tickets can reference wiki pages, chat can become your company’s heartbeat. All of those capabilities help to decrease friction, distribute knowledge, and keep the entire organization plugged in to the right priorities. But they’re still separate tools. You still have to flip from one app to another to search, get the details, or make updates. Each tool is still deployed and managed in separate software versions, which (sometimes) fall out of compatibility with each other. And don’t forget that you’re still going to pay licensing and maintenance for each tool. Even at a bundled rate, you’re probably getting soaked. Half-way integrated is better than the patchwork quilt approach, but it still creates implicit silos of data, and introduces other hidden costs. It’s like being half-way delicious. Speaking of delicious, what happens when you *actually* integrate tasks, wiki, chat, releases, documents, source code, support, and continuous delivery? If you could get all of these chunks of functionality in a single system, how would it affect your experience and productivity? Isn’t that so much simpler? A seamless experience for managers, development staff, creatives, support and even customers to get involved in. A single source of truth for what’s important, what’s done, and what’s next. One place for your institutional knowledge to live on. On-boarding becomes easy. Hard-won company wisdom doesn’t disappear when someone leaves or changes roles. One search box that is deeply connected to all of your projects, source code, documents, information, tasks and discussions. Find a specific key word or error code no matter where it’s hiding. There are lots of situations where best-of-breed thinking makes sense. In areas where a specific tool improves your productivity, saves money, or just makes work more fun, it can be worth it. If the need you’re filling isn’t central to your business, then it’s not a huge risk to try (and maybe abandon) something new. But that’s not what we’re talking about here. The way your team organizes and works together is possibly the most important and valuable part of your entire business. Trying to run things using a patchwork quilt of point solutions might seem cool at first, but it’s probably not where you want your team spending their time. That’s why we built GForge. Because we do what you do every day, and we think it should be easier. Come try GForge Next, and let us know what you think. Note: My editor wanted me to include email as part of this discussion, but it added way too much to the article. GForge does some great things with email, and I will publish something soon to show how and why. Git Server Side Merges – Right now server side merges work between any two branches except when the destination branch is master. Turns out the is a bug with Git itself and we already have a patch from the Git development team and we’ll continue testing that out. Continuous Integration – We’ve begun designing the mocks required for building a Continuous Integration dashboard for all GForgeNEXT projects using Jenkins. This will complete our vision of making the integration between GForgeNEXT and CI systems tighter which reflects how integral they are to software teams. GForgeNEXT iOS – The first view for the GForgeNEXT iOS app has been stubbed out and work will continue over the coming months. Dependency Management – When a ticket has predecessors (i.e. blocking dependents) when those tickets are taken care of GForgeNEXT will notify the assignee and submitter of the ticket that work can begin on that ticket. Those notifications will happen with growls which are also sent via push notifications via Adroid/iOS application. This is a big step towards helping PMs and project leads with automated dependency management. Improved Link Handling in Docman – Currently in 6.4.2 and prior the links to documents in docman explicitly ping to the most current version (i.e. version 7). The problem is if you email that or include it in a ticket or wiki entry that version may eventually be replaced with newer ones. We’ve made it so the links in docman will always give users the most current version. Don’t worry you can still explicitly send the link to a specific version of a file if you want. A handful of bug fixes for v6.4.3 are being actively worked on.